Wilkes County was formed in 1777 from the ceded lands of the Cherokee and Creek Indians. Phillip Going a Wilkes County Freeholder who signed a petition to the Continental Congress in 1777 asking for the removal of General McIntosh from command. p. 99 15 Apr. 1786, George Lumpkin and Ann his wife, to Moses Going, all of Wilkes Co., for £19, branches of Buffloco fork of Long Creek,… River, adj. N. by vacant land, E. by …., S. by Vinson Greer, W. by John Lumpkin, 200 acres, granted Lumpkin, 15 Aug. 1785. Wit: Robert Lumpkin, John King, Jno. Cunningham, J.P. 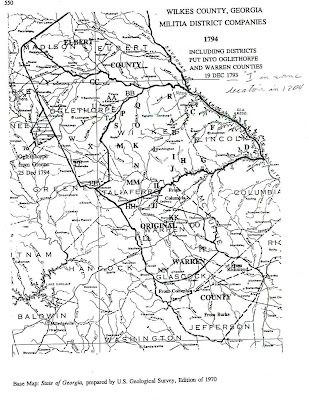 The Wilkes County Papers, 1773-1833, page 73, by Robert Scott Davis Jr.
Ref: Early Records of Georgia, Wilkes County, page 111 (Page 312) MOSES GOYNE (signed GOING) to John Lumkin, 200 acres on waters of Long Creek adj. said Lumpkin. 5 Dec 1789, Thos. Routledge, Geo. Lumpkin, Aaron Springfield, Test. p. 312 5 Dec. 1789, Moses Goyne to John Lumkin, both of Wilkes Co., for £10, 200 acres on Long Creek, adj. W. said Lumkin, S. by Bankston, E. by Greer, N. by Greer & Lumkin. (signed) Moses Going. Wit: Thomas Rontledge, Ann Springfield, George Lumkin, Jesse Heard, J.P.W.C. Regd. 1 Sept. 1791. Notes for District LL: Boundaries as of 2 Oct 1793: Georgia Military Affairs, Vol II, Part 1, p.55: Captain Matthew Hubert’s District, 3rd Co., 1st Bn, 4th Reg^t: --Beginning at Goings Mill [on the Ogeechee] running [east] along the [Upper] Trading Road to the ridged between Rocky Comfort and Long Creek, then up leading to Seal’s old place, thence and old road to Powell’s road, then along said road to the head of Clower’s Creek, then down the said creek to the mouth, then down the Oheeechee to the beginning. p. 71 23 July 1791, Ignatious Few to Robert Abercrumbia, both of Wilkes Co., for £75, on bank of Ogechee River , on bank of Ryals Branch, 225 acres, E. part of 780 acres granted to said Few, 2 Mar. 1791. (signed) I. Few. Wit: Bn. Few, Moses Going. Proved by Moses Going & Benjamin Few, 15 May 1791 before Andw. Burns, J.P. Regd. 18 May 1793.
p. 185 23 July 1791, Ignatius Few to Moses Going, both of Wilkes Co., for £250, west part of 780 acres, granted 2 Mar. 1790, adj. bank of Ryals Branch, Ogeche River, down river to mouth of Ryals Branch, up branch 555 acres. (signed) I. Few Wit: Bn. Few, R. Abercrombie. Proved by Robert Abercromby and Benjamin Few, 15 May 1792, before Andw. Burns, J.P. Regd. Aug. 1792. General Note: The area of this district was split in the creation of Olglethrope County from Wilkes County in December 1793. Captain John Fluker continued to command the company of militia in 1794, made up of residents of the two counties. Returns for most of those remaining in Wikes County are identified by a “W” in the Notes. All others can be found in the 1794 Tax Digest of Olglethorpe County in Captain Fuluker’s District, unless they moved out of the district. Ref: Wilkes County, 1793, Early Tax Digest, Capt. Neal’s District; #14, MOSES GOING; County in which the Lands are: Wilkes; 200 acres; 1 Free male white person from the age of 21 and upwards 1/9. Amount of the value of Lands & c. at 8/2 pr. F100; f136.s 4. Amount of each persons tax: s. 12. d. 11; Who the Lands adjoins or what water courses on Crumley (?). On motion Ordered that Nathaniel Coats former high Sheriff of this County – Show cause Tom Morrow Morning at Ten OClock why an attachment Shall not _____ against him for not paying to the plantiff the Sum £44 10____ so much thereof or has been obtained under Execution in the above cause July 7th 1796. P112 13 June 1795, Daniel William of Wilkes Co., Ga., to Asa Tindal of Warren Co., Ga., for £50, on Lick Creek waters in Wilkes Co., 100 acres. (signed) Daniel Williams. Test: Isaac Goyne, James Goyne. Proved by James Goyne, 2 Oct. 1796, Micajah Little, J.P.
p.146 18 Nov. 1796, Isaac Milligan & Sarah, his wife, to Job Callaway, all of Wilkes Co., for $278, on Clarks Creek waters, 200 acres including plantation & old lines originally surveyed by John Brownfield, adj. John White, Danl. Williams, Moses Milligan, Thomas Lackey, Jasper Crane, part of 300 acres granted to James McCannon & Wm. McCree, Arnald Atkins, Thomas Goans, J.P. Regd, 2 Jan. 1797. The Defendant Moses Going is hereby required personally or by his Attorney to be and appear before the Honorable the Inferior Court at a Court to be held in and for the County of Wilkes on the fourth monday in February next then and there to answer the plantiff in an Action on the Case & to his damage two hundred dollars or in default thereof the said Court will proceed thereon as to Justice shall affertain. Case. Settene at dependats Cost on information of the Clerk. General Note: Lot, as in Town Lot, is spelled Lott more often than not. All lots in Town of Washington, unless otherwise noted. Page 148 (ibid), MOSES GOING PLF vs Joseph Boren Def. Petition of Moses Going for debt due from Joseph Boren to John Henly, Junior, but assigned to Going by Henly, (s) Walton aty. For plff. Papers served 6 July 1801. (s) Thomas W. Gaines. July Term, 1801; Found for the plaintiff; Note of debt to John Hendly, (s) Joseph Boren, 8 August 1799. On reverse side it is signed by John Henly and Moses Going before (s) Peter B. Terrell. General Note: All Town Lots in Town of Washington, unless otherwise noted. Amos Wright was my gggggfather. I appreciate being able to gather this information and add it to my records. I have a Lucy Going born about 1789 Georgia, with my gg grandfather Rueben Gaskins? born about 1810 Kentucky and his brother Aaron Gaskins born 1808 and a William Going, Lucy's grandson born about 1845 Georgia. I wonder if these are the same Rueben and Aaron Going listed my gg grandfather migrated from Georgia to Butler Co. Kansas in about 1860 per the Butler Co. Census. They all have an A. as middle initial. Rueben A./Aaron A.? Lucy Going was listed with her sister Mary in Georgia in 1850 in Pulaski, Co. Georgia. Rueben and Aaron were there also. Maybe you can shed some light on this for me.